The Focus Group was formed in 2006 to enable some serious amateur photographers from the South of England to work together and collectively exhibit their work. The Group is now eight in number and their interests cover a wide range of photography including conventional landscapes, street and urban work, collages, documentary photography and detailed plant close-ups. The group travel together for two weeks in February each year to explore the photographic possibilities of an area of the UK. 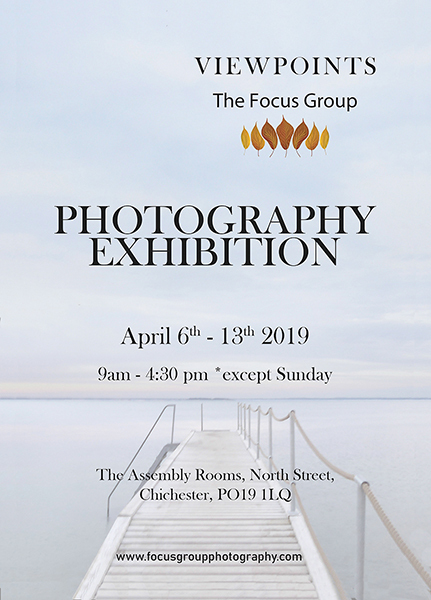 Their annual exhibition will be held in the Assembly Room, Chichester 6th – 13th April 2019 from 9.00am to 4.30pm every day (except Sunday). Their exhibition has been running for more than a decade, is very well attended and well regarded. There will also be displays of projected images. The Group have a website at www.focusgroupphotography.com where you can see many examples of their work.